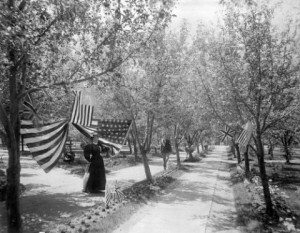 When John and Mary Elitch purchased the 16-acre Chilcott Farm, it was home to apple and cherry orchards and a host of mature cottonwood trees. They added pathways through the trees, planting bushes and flowers along them as well as putting picnic tables in the orchard areas. Mary also put fountains along the paths. 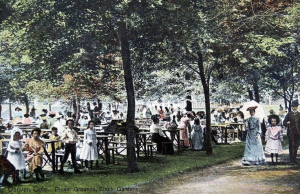 A fter entering the park, people approached the central area on a grand tree and floral-lined walkway. Each year, Mary added more flower beds. The scents of apple blossom and heliotrope filled the air. By 1905, more than 60,000 plants graced the park. 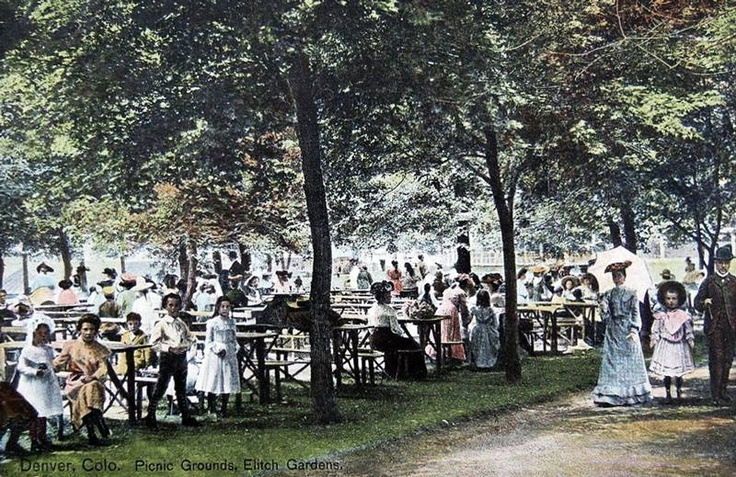 At the turn of the century, Tom Long had a deep interest in expandi ng the gardens at Elitch’s. He designed new beds and worked in the greenhouses, growing plants for the park and for sale to shippers, suppliers, and florists. The Elitch Garden Company (his wholesale supply business) soon expanded into a retail business and the Eltich-Long Flower Store was opened on 15th Street. The floral company had one of Denver’s first floral delivery trucks. 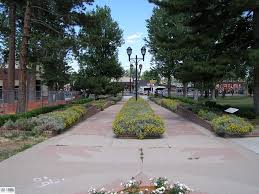 Tom Long was appointed to the Denver Parks Board in 1912 and was known as a landscape and park design expert. The Elitch-Long florists became known for their “Rainbow Tint” carnations. They were the first to invent a way to evenly color to color the petals of white carnations. Instead of sprinkling dye onto the petals (which was messy and uneven) the Elitch-Long carnation was set into water with liquid dye. The dye was absorbed through the stems and created bright, smooth color. Shades included coral, blue lace, lilac, sun mist yellow, aqua (iceberg), champagne, and cornflower. After Tom Long’s death, Mary’s brother Edward Houck managed the flower store until his death in 1915. In 1916, Elitch Gardens and the floral business were sold to John Mulvihill. He expanded both, hiring young Walter Lehrer to manage the floral business. Lehrer would go on to found Lehrer’s Flowers, still in business today. Mulvihill also razed the unused zoo enclosures and replaced them with new greenhouses, allowing the park to grow even more bedding plants (tens of thousands, including exotic blossoms, under 160,000 acres of glass) for transplant within the Gardens. 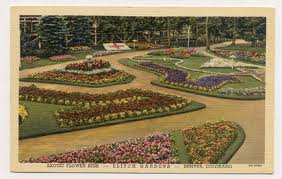 Acres of carefully tended formal gardens were added and newspapers lauded the park as a “flower-laden wonderland.” The famous circular “Not to see Elitch’s is not to see Denver” display was created under his tenure. John Mulvihill’s son-in-law, Arnold Gurtler, took over all Elitch enterprises when Mulvihill died in 1930. Gurtler expanded the formal gardens and built additional greenhouses. Under George Gero, head gardener, more than 50,000 plantings we re set out each spring and the popular “Dahlia Farm” was established. 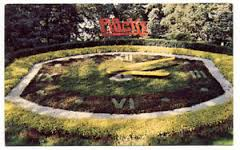 The park achieved national reputation for its topiary creations, including the ever-changing Floral Clock. The clock was powered by a buried electoral motor and kept perfect time until 1995, when the park moved to downtown Denver. The clock was relocated to the foot of the Ferris Wheel at the new location but never maintained time again, despite multiple attempts to repair it. Gurtler also expanded the floral business when he partnered with Park Floral to create the Park-Elitch Floral Company. A branch store was opened in the Denver Dry Goods building. After 1950, the gardens at Elitch’s shrank in size as the amusement ride areas expanded to keep up with the post-Disneyland model. Greenhouses were razed and the Park-Elitch Wholesale Florist Company was closed in 1965. Still, attempts were made to maintain some of the charm. A news article in 1980 referred to flower-lined walkways, a fountain splashing into a pool of carnations, a miniature Ferris Wheel with baskets of flowers in the middle of a small pool, and the yellow coleus and geraniums. The paper bragged of “some of the most beautiful gardens in the world”, even comparing them to the renowned Tivoli Gardens in Denmark. Still, Sandy and Budd Gurtler (Arnold’s grandsons) worried over the ever-expanding pavement and made garden areas part of the new design as plans moved forward to relocate the park to downtown Denver. Designers struggled with how to turn a former rail yard filled with junk and industrial waste into a luscious park area. In 1995, the new Elitch Gardens opened with 84,000 square feet of groomed, blooming gardens and 3000 tall shade trees. That summer was filled with drenching rains, the next with drought, and the new trees died. Fast-growing trees were imported from Australia to replace them and provide the beautiful shaded gardens the public had been promised. On July 17, 1996, the original location of Elitch Gardens was sold. The contract was signed sixty years and one day after Mary Elitch died (7/16/1936). The following day, as they made one last trip around the grounds and discovered an ancient maple tree had fallen. The tree, located near one of the theatre’s side doors, had narrowly missed the theatre, instead falling upon the administration building. The tree had sheared off, about five feet up, as if it had been cut by an axe. Rumors immediately began to circulate that Mary’s ghost, sighted for years within the theatre (always wearing a white Victorian gown and large hat), had emerged to chop down the tree as a statement about the sale of her beloved gardens. Please join me next week for a discussion of hot air balloons and Ivy Baldwin, whose balloon was a regular feature at the early Elitch’s Gardens. Each Friday, I will blog about some aspect of Elitch Gardens, early Denver, or other topics related to my next novel, Escaping Yesterday. In between, I will post small factoids on my Facebook page. You can join me there and I love new friends (https://www.facebook.com/pamela.nowak.142).